A view in ink of the Crown Inn at Weynouth in Dorset. Shortly after Grimm made this drawing, the inn passed into the possession of Emmanuel Charles, one of the most notorious English smugglers of the 18th and 19th centuries. 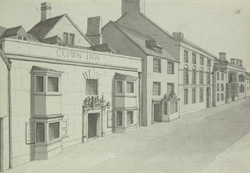 He used the Crown Inn as headquarters for a large and vicious smuggling gang, whose territory spanned Weymouth, Lulworth Cove and the Isle of Purbeck. Many of the gang were members of Charles' extended family - 27 of them were arrested for racketeering offences. In spite of his success as a smuggler, he would die in poverty in 1851 in the home of his son Israel.